Olives are the nibble most closely associated with martinis but I always think that seafood is one of the best matches. 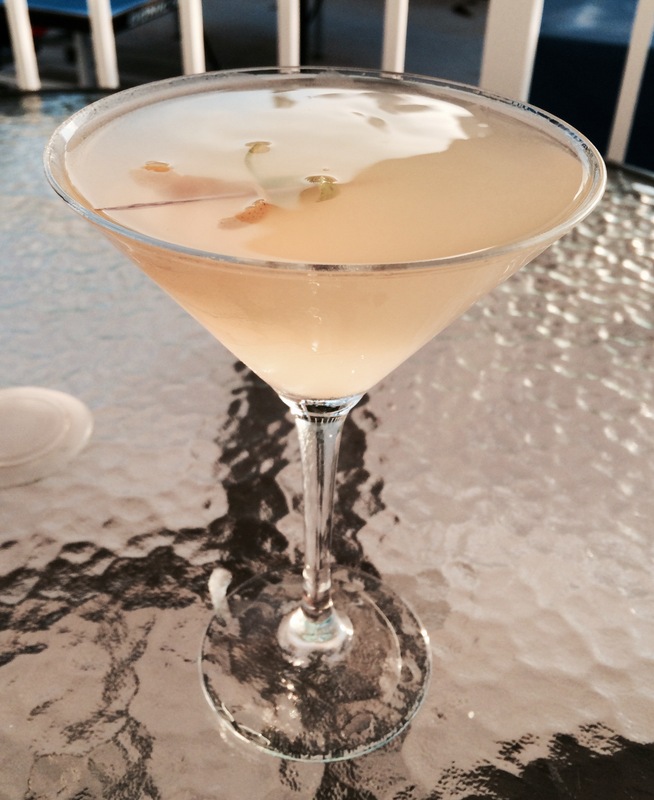 It’s fresh, cold and goes well with citrus, just like a good martini. Consuming seafood also brings its own element of danger (food poisoning? Mercury? ), much like the danger associated with drinking a strong martini. 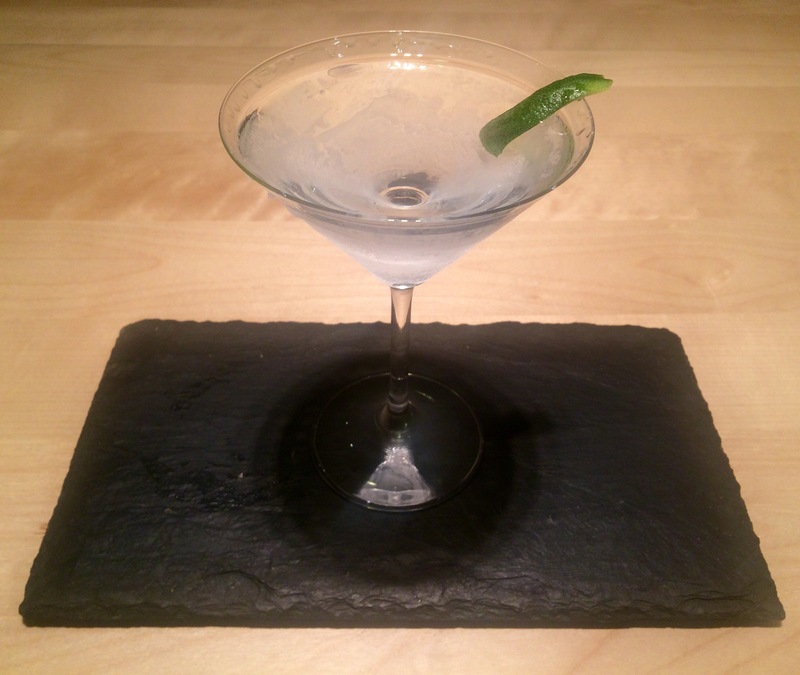 So here is a simple and easy recipe for a seafood canapé to serve when you pour a drink. 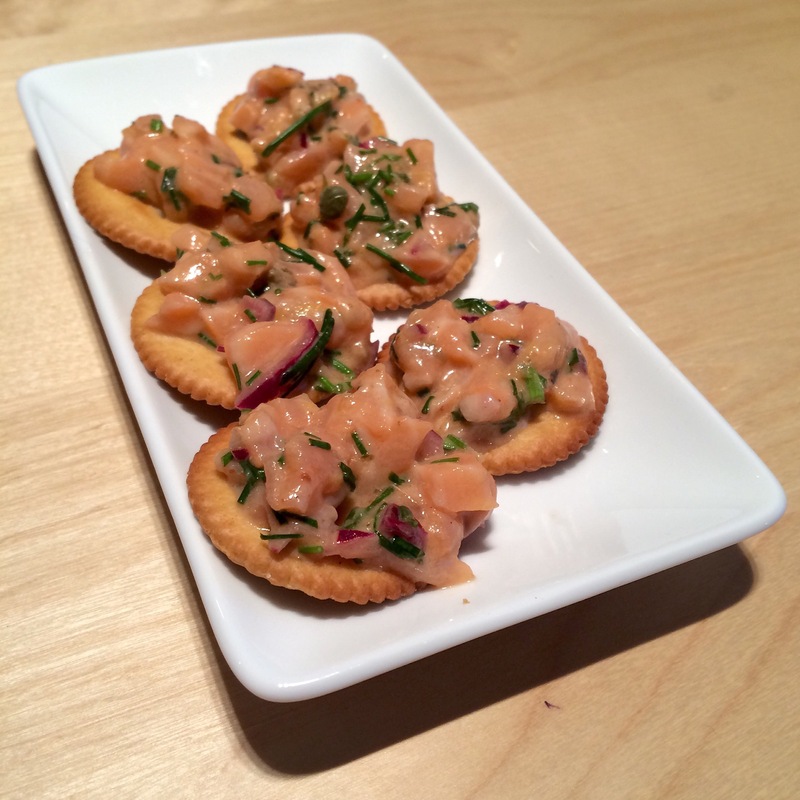 Salmon tartare served on ritz crackers combines chilled, zesty, silken fish on a crunchy carb base. Finely chop the solid ingredients listed below then mix everything well and serve immediately. The mixture should be plenty for a large number of ritz crackers. Depending on how much you spoon on each it could make over 20. You could also serve the mixture on miniature blini, which I like very much. 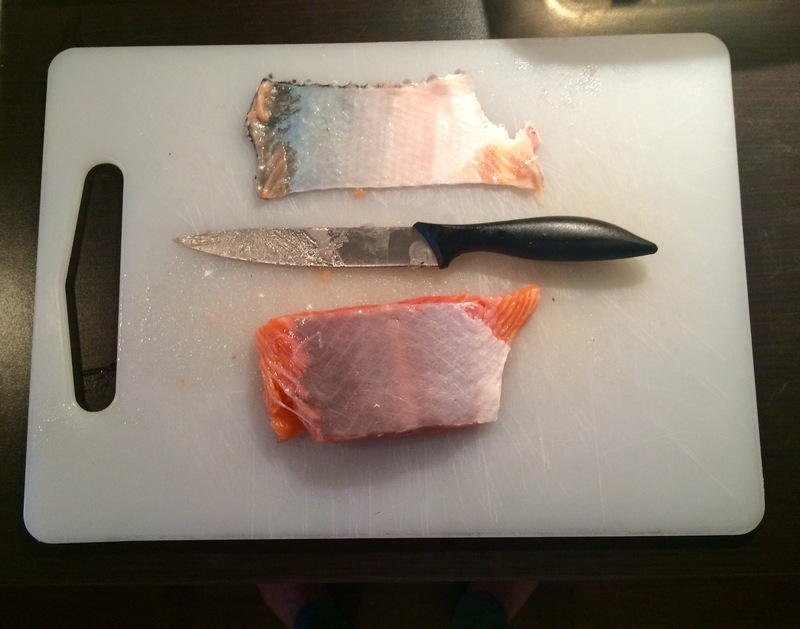 If you have to remove the salmon skin with a sharp knife you can roast it with a little bit of salt and oil for a crunchy side dish. You can serve it as part of a full meal. 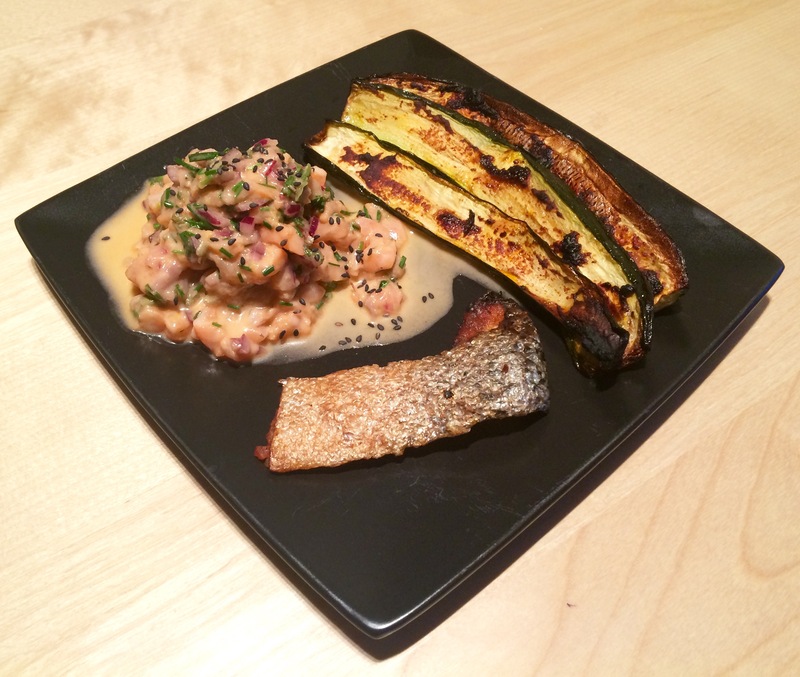 Here I’ve dished it up with more salmon tartare and some grilled courgettes. Or you could simply serve the roasted skin dabbed with a little sweet chilli sauce, which makes an unusual snack to serve with a martini. Note that there are numerous variations of the above tartare recipe so I would recommend experimenting – although always ensure that the fish is extremely fresh! 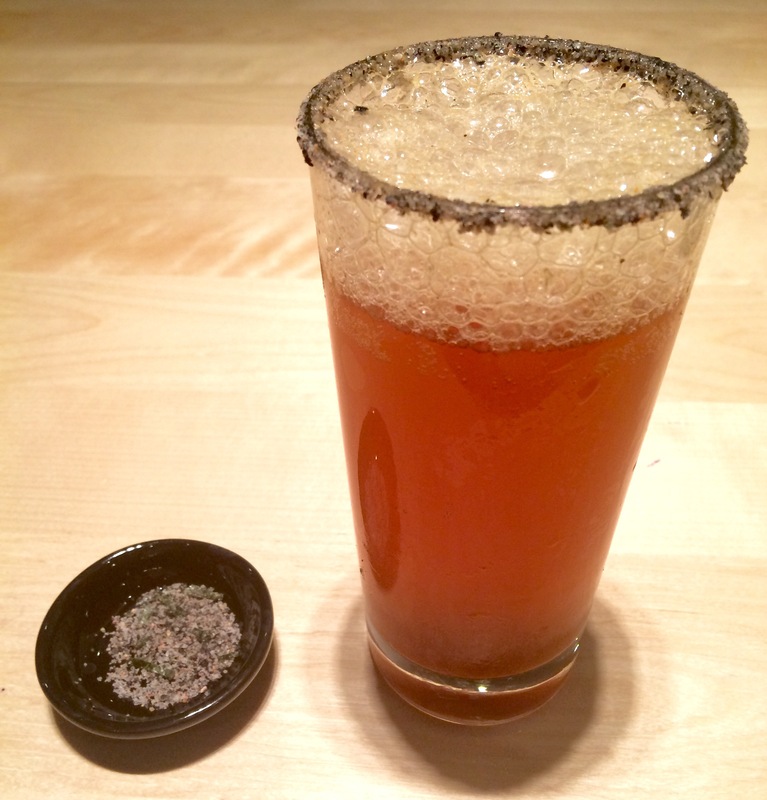 This is my Japanese variation of a classic Mexican drink – the Michelada. I have named my version after my friend from Mexico City who introduced me to the concept. 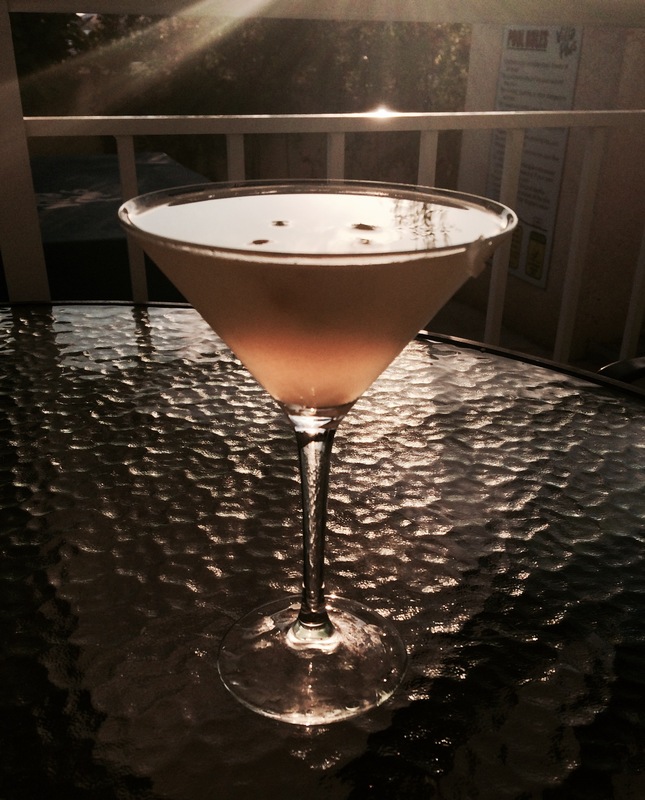 It’s not a martini but hey – I can’t drink martinis ALL the time! Plus, summer is coming and this is a great summer drink. It’s very similar to a standard Mexican Michelada, which is essentially beer, lime juice and some additional savoury and/or spicy sauces served in a salt-rimmed glass. The drink is comparable to a Bloody Mary and very good for a hangover or alcoholic rehydration on a hot day. However, the mixture for the glass rim in my version is heavily influenced by Japanese ingredients. If you can’t get hold of them, I recommend you try a more standard recipe with beer, Worcestershire sauce, lime and salt at the very least, so you can experience this wonderful drink. The ingredient combination might sound unusual, alien and even unpalatable to some of you but trust me, I’ve had lots of experience. You might ask me why I would combine a Mexican recipe with a Japanese tang. Well, it’s mainly because I tried this and it worked. Otherwise though, Japan and Mexico have more in common than might meet the eye. Obviously both countries feature heavily in the Kill Bill franchise. Both countries also have extensive experience of earthquakes. If there’s ever a rumble and a shake of the earth your Mexican and Japanese friends will be the first to jump under a table – fact! However, most importantly for the sake of this blog, the cultures of both countries hold flavours and cuisine in extremely high regard. Both Japan and Mexico are blessed with climatic diversity, which in turn has led to very distinct regional variations in things like agricultural produce and other forms of naturally available food. This in turn has led to the evolution of a rich assortment of cuisine specialities. In the case of Mexico I think that the highly sophisticated cuisines do not receive enough international acclaim. I love Japanese food and I am very glad that it has received a lot of global recognition, evidenced not least by the multitude of Michelin stars awarded to Tokyo. Mexican cuisine however, does not seem to have had the same international recognition. It appears to have been hijacked by numerous profit-making rip-off versions, selling a business model rather than genuine Mexican food. Of course, there are exceptions, particularly in the United States (and there are a handful in London) but it is far easier to find an authentic Japanese restaurant than it is to find an authentic Mexican one. I hope that in the future Mexican cuisine will be given the acclaim it deserves. 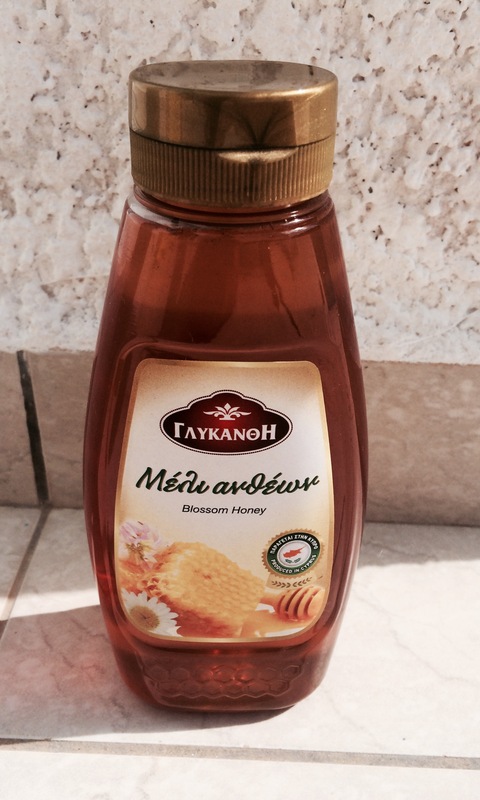 But I digress… here is my recipe. 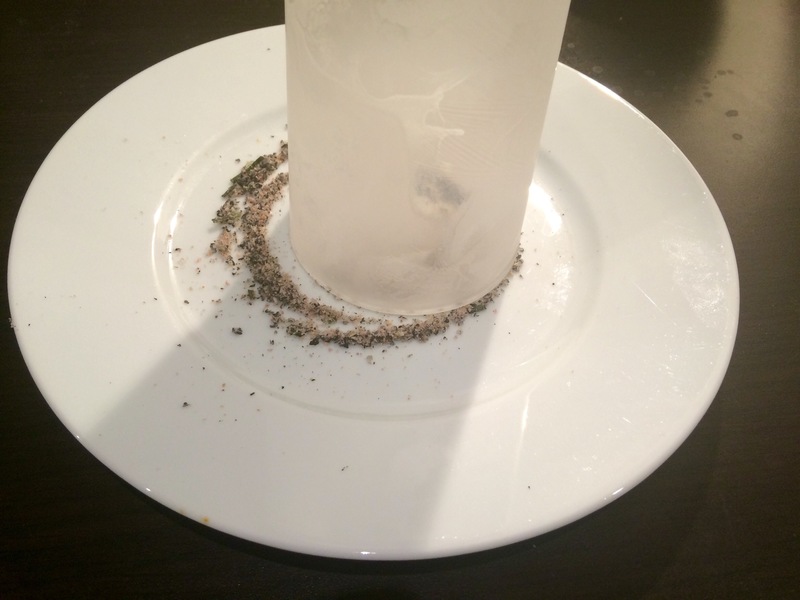 Run a tall beer glass under a tap and place it in the freezer for at least 20 minutes (preferably longer). 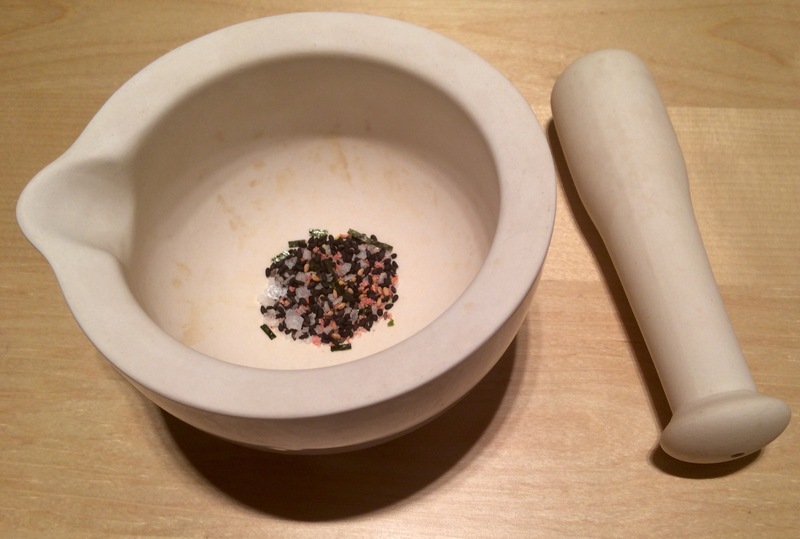 Grind a pinch of sea salt, a pinch of furikake (a salty-umami Japanese seasoning), a pinch of caster sugar, a pinch of chilli powder and a pinch of sesame seeds with a pestle and mortar. 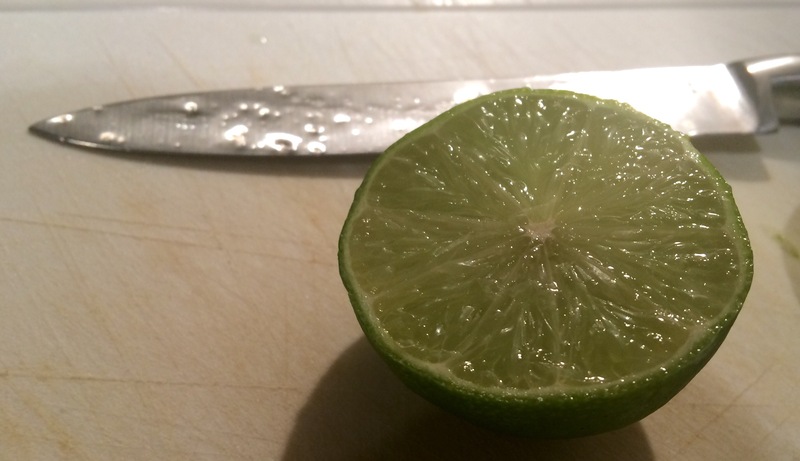 Slice a lime or yuzu fruit. Rub one half over the rim of the glass. Rim the glass with the ground mixture. Save any leftover mixture for later. 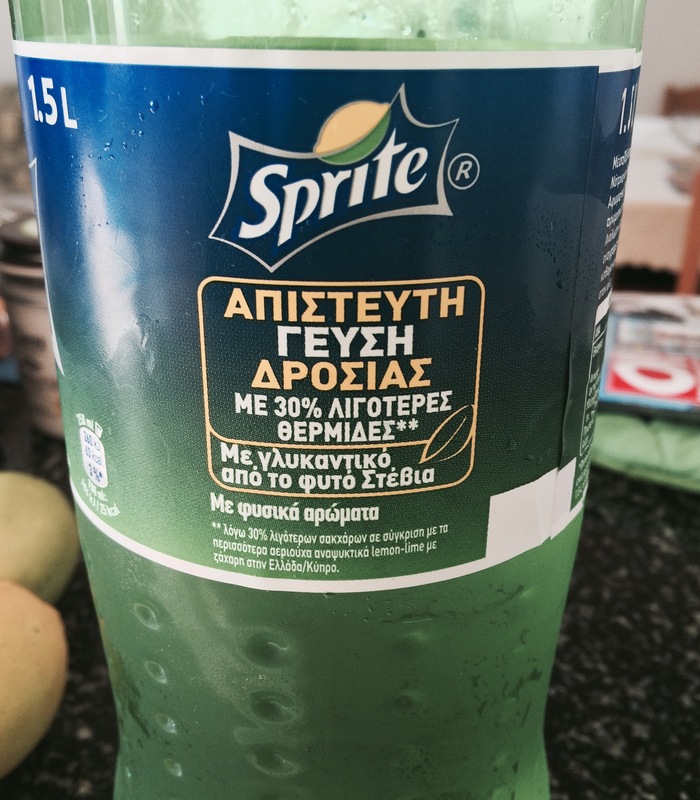 You will need the lime/yuzu as well. And last but not least… A light beer! 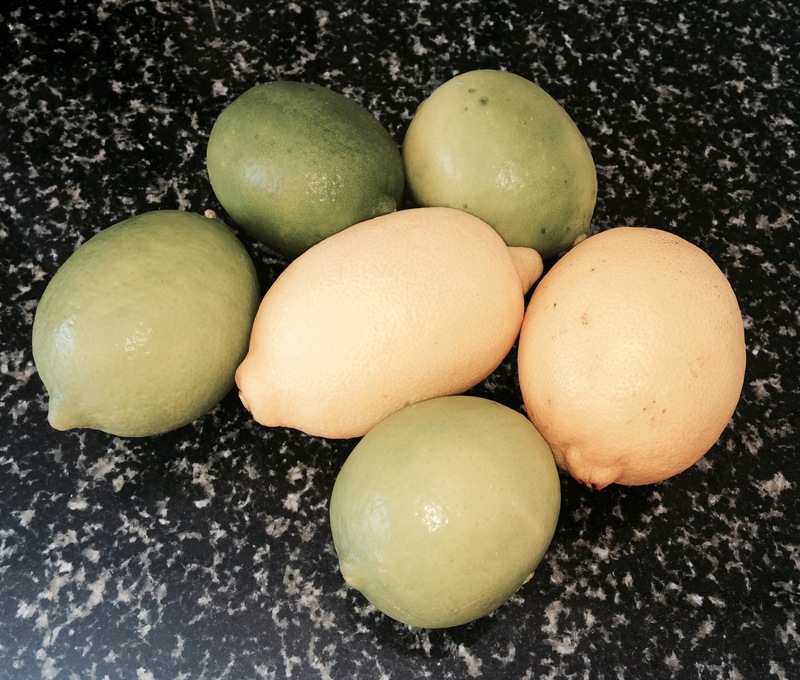 You can add an ice cube or two to cool it down, or even better, use frozen lime or lemon slices. Serve with the leftover salt/chilli/sesame/furikake mixture in a side dish. Lick your finger and dab it in to taste, as you would with some salt with a tequila. 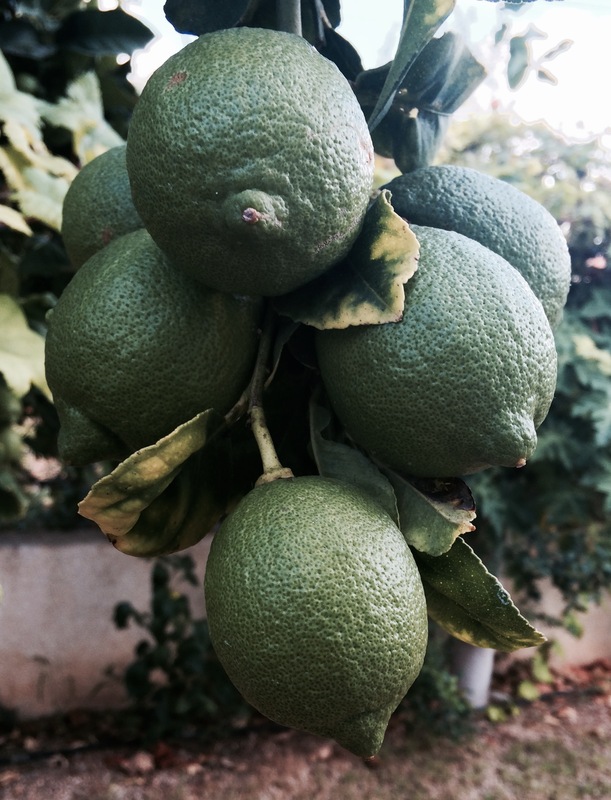 Serve with a wedge or two of lime/yuzu as well. And it will go with a wide range of izakaya-style snacks too. 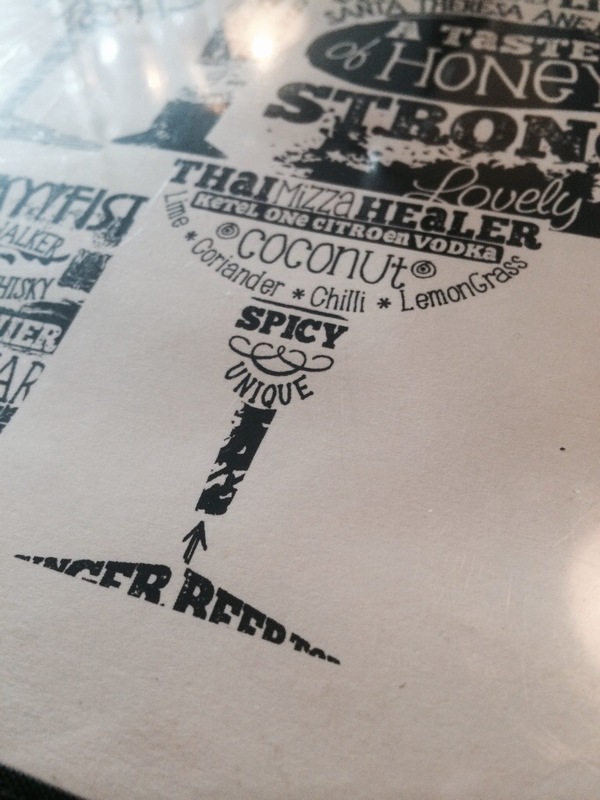 I like spicy things and intense Thai flavours, so when I went to Translate Bar in Shoreditch I ordered their Thai Mizza Healer cocktail. 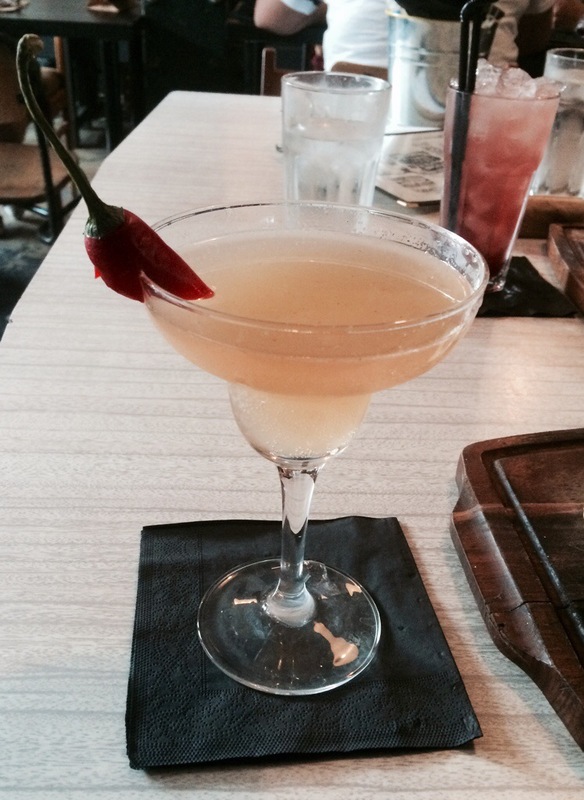 It contains lemon vodka, coconut, lime, chilli, coriander and lemongrass. It was sweet, sour, tangy, hot and refreshing all at the same time. 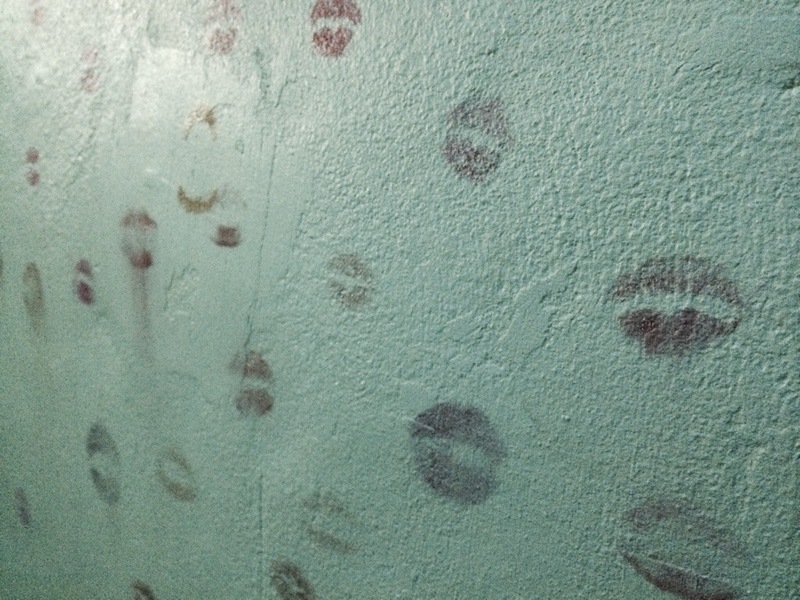 Be careful you don’t drink too many and end up snogging the wall though.